About the Book " The Art of Retirement"
The Art of Retirement uses the story of Michelangelo’s life and art to facilitate the creation of your masterpiece—a resilient, well-crafted portfolio along with a fulfilling life and legacy. This unique book serves as a life guide—helping you understand the art of investment management and financial planning while also providing an insightful perspective on life and retirement. Below, told through the story of a blank canvas, are the inspirational events that led to the writing of this book. The idea of writing a book has long been on my bucket list. As a professional who deals with issues surrounding money, lifestyle, and values, I knew that I possessed helpful, worthwhile advice. But with my everyday workload and family priorities, a book wasn’t on the horizon, and the need to act on a bucket list was even more distant. Writing a book like The Art of Retirement did not seem urgent, not until I had the proper motivation. Coaxing me out of a world of numbers, landing me in a maze of words and emotion, was my serendipitous connection to four men. Together these men shared a devastating diagnosis and an inspirational bond. Bruce Anderson, Augustine (Augie) Nieto, Eric Scoggins, and NFL great O.J. Brigance, were all diagnosed with ALS, also known as Lou Gehrig’s disease. Their passion for life in the face of death was my bold catalyst for doing more than offering sympathy, prayer, and pocket change to affect the cause. Bruce Anderson was my father-in-law, a man that I knew to be active and full of life, someone who’d soldiered on through illness and surgeries before ever being diagnosed with ALS. When I wed Lee, Bruce’s daughter, not only did I marry the crown jewel of the Anderson clan, but I received the unexpected richness of an extended family. 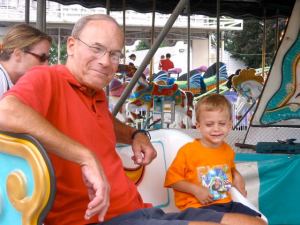 In 2007, the landscape of our lives changed dramatically with my father-in-law’s diagnosis. In sharing the news with me, Bruce said, “It’s not good, Gary.” At the time, I didn’t know anything about ALS, and maybe I didn’t even want to hear the definition of “not good.” It was all inevitable, as I soon learned that ALS is quite often a death sentence with a typical life expectancy of 3 to 5 years after diagnosis. It might have ended there, with a deeper introspection about my job, a keener insight to what I, Gary Williams—the CEO of Williams Asset Management—could offer clients in terms of financial success and peace of mind, particularly when it came to retirement. But it didn’t. In truth, I was only at the threshold of my metamorphosis. During the last year of Bruce’s life, I had an opportunity to meet others afflicted and involved with ALS, including Augustine (Augie) Nieto and Eric Scoggins. Augie was a prominent leader in the fitness industry and Eric a professional football player and successful businessman, both diagnosed with ALS. The point of a road trip to San Diego was Augie’s Quest, an annual beach bash charity ball. Its purpose is to raise money for the Muscular Dystrophy Association’s (MDA) ALS research initiative–an aggressive, cure-driven effort focused on finding treatments and cures for ALS. Eric’s emotional struggle was nearly as significant as his physical one, and my father-in-law did not hesitate to offer support and a friendly ear, even in the wake of his own plight. This further inspired me, as I was profoundly moved by Bruce’s generosity and the generosity of those around us. Also in attendance at Augie’s Quest, lending their support, were football legends Ronnie Lott and Marcus Allen, as well as Ronnie’s former San Francisco 49er’s teammate Keena Turner. I vividly recall the event’s most powerful personal moment, when Ronnie Lott made a touching presentation about making the most of life, or as Lott put it, “exhausting life.” I watched from the crowd as my childhood football heroes lifted my father-in-law’s failing body from his wheelchair, hoisting him to a victorious and independent position. The impact was incredible. That experience might have been enough to inspire me, forging the connection between my expertise and how I might better serve an array of ALS efforts. But only days later, I learned that fate wasn’t done providing me with insight and outlets. After visiting the West Coast and Augie’s Quest, I happened across an article in the Baltimore Sun. It was about O.J. Brigance. I’d never heard of O.J. Brigance and, in turn, I was certain O.J. Brigance had never heard of me. O.J. was a 12-year pro football veteran with an extensive resume that included the CFL and NFL. He is one of a few players to have won both a CFL and NFL championship and the only player in the history of both leagues to win those championships for the same city–Baltimore. Coincidentally, O. J. also suffers from ALS. With that one point in common, I decided to call O.J., who invited me to lunch at the Ravens headquarters. As time moved forward, we stayed in touch, seeing each other at the Johns Hopkins Packard Center’s annual Fiesta 5k race where O.J. was the honorary chair. In 2012, O.J. invited me to serve on the board of the Brigance Brigade Foundation. We worked closely together on projects for the foundation, allowing me personal access to O.J.’s everyday life. I saw a man who looked at his situation and his adversities as a challenge. He’s never allowed it to beat him or ruin his life. Instead, at present, he remains focused on living the best life he can. 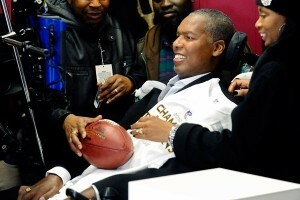 I am continuously awed at O.J.’s selflessness, as he works tirelessly through the Brigance Brigade Foundation to help as many people with ALS live the most fulfilling life possible. The former football great inspires not only through his actions, but through his ability to persevere. Even though O.J. can only move his eyes and relies on machines, equipment, and people to help him breathe, speak, eat, and get from place to place, he still works full time. Sadly, as I have learned, one of the cruelest aspects of ALS is that the victim’s mental faculties are typically unaffected by the bodily degeneration. I always tell people: think Stephen Hawking. Despite any physical impairment, O.J. runs his foundation with the highest level of effectiveness, professionalism, and charisma; he also vacations with family and, overall, lives a full life regardless of circumstance. With these four men in my memory and my future, the only problem was the realization of how I could make the greatest impact via my able-bodied presence. I thought endlessly about the many ALS related events I’d attended. People, many of them famous, continually offer generous support through their time and talents. What could I contribute beyond my everyday efforts? That’s when I did the math and discovered the answer was as obvious as 2+2. Without arrogance or ego, I will tell you that I’m very good at my job. And if my job is to handle your money, your investments, your retirement, I believe a touch of confidence backed up by result is a good thing. In my head are the tried and true formulas, the paths for outstanding retirement savings. It isn’t a Billboard Hot 100 song and the numbers most closely associated with me won’t ever make an NFL record book. But within my personal resources is the key to retirement savings, the kind of money the majority of people will, one day, need. Upon that realization, my bucket list became my present-day passion, and I decided to write The Art of Retirement. In a world of numbers, I chose to let creativity be my guide. I designed the book using Michelangelo’s life as my scaffolding for retirement success, drawing analogies and insight from the world of art. Where the Great Master employed artistic techniques, I used financial prowess. In many respects, I see life as art. The visual is unique to each one of us, and like a sculpture, finances can be molded and changed. I transferred my expertise onto the canvas of this book, explaining, in detail, how the average person can reach the goal of a prosperous and worry-free retirement. The Art of Retirement is poised to help anyone who wants to make the investment and pay attention, but the profit is all about helping those most closely associated with ALS, as well as other charitable causes. They include the Maryland SPCA and Y of Central Maryland. On the horizon of ALS research are new therapies, techniques, and medications to combat the disease. In the meantime, I’ve checked one goal off my bucket list, creating a new profit margin in the win column of a devastating disease.